The researchers also found that people who frequent tanning salons are more likely to use a low-SPF (sun-protection factor) sunblock, further raising their odds for skin cancers. "It is crucial to ensure that any individual who has been repeatedly exposed to ultraviolet radiation, whether through indoor tanning or not, be screened for skin cancer," said Dr. Victoria Sharon, who directs dermato-oncology at Northwell Health in Great Neck, N.Y.
Sharon wasn't involved in the new study, but said the data shows that the frequency of skin cancer checks "remains low" for all Americans -- including those at high risk. The new study was led by Carolyn Heckman of the Fox Chase Cancer Center in Philadelphia. Her team examined 2015 data on more than 30,000 adults tracked by the annual National Health Interview Survey. 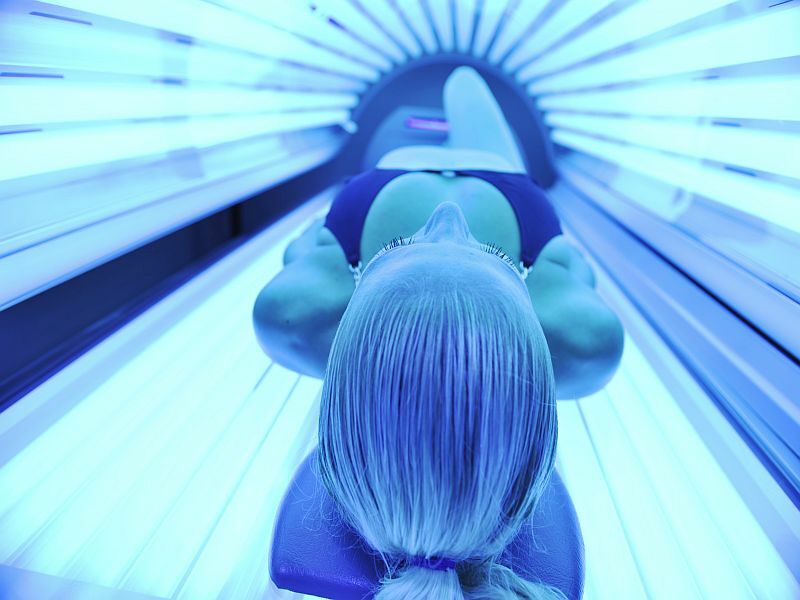 The findings showed that about 16 percent of those surveyed had ever used a tanning bed, and about one-fifth of that group said they'd indoor-tanned at least once during the past year. Indoor tanners were more likely to have ever undergone a doctor-guided skin cancer check compared to people who'd never used the devices -- 30 percent versus 19.5 percent, respectively, according to the report. But that still means that 70 percent of indoor tanners have never consulted a trained physician to check their body for potentially malignant skin lesions. That's in contradiction to a 2014 recommendation by the U.S. Food and Drug Administration that "persons repeatedly exposed to UV radiation should be regularly evaluated for skin cancer." The FDA mandated that this warning be posted by manufacturers on all indoor tanning devices. Interestingly, people who'd used indoor tanning recently (within the past year) were less likely to have had a skin cancer check than those who's last tanning salon visit was further back in time. According to Heckman's team, that could mean that people who've given up indoor tanning may be more "aware of their increased risk and seek skin cancer screening accordingly." The study also found that while 12.6 percent of people who'd never used tanning beds used a relatively low-protection sunscreen (an SPF between 1 and 14), that number jumped to about 15.5 percent among indoor tanners. "Thus, some individuals may be putting themselves at risk for skin cancer in multiple ways," Heckman's team said. The study authors added that "almost 5 million skin cancers are diagnosed annually in the United States, and skin cancer incidence has been rising over the past few decades." Dr. Doris Day is a dermatologist at Lenox Hill Hospital in New York City. Reading over the new findings, she stressed that "indoor tanning continues to be an important source of skin cancer risk." Day said the study shows that "we still need to improve education on the need for regular skin cancer screenings by a board-certified dermatologist, and also for regular self-exams." The study was published online April 4 in JAMA Dermatology.